FLAVORx Inc. announced today, the launch of “Yo Gabba Gabba! Medicine-Time Flavor Spray”, an innovative new product designed to improve the medicine-taking experience for children and their parents. “Yo Gabba Gabba! Medicine-Time Flavor Spray” is a flavored spray that coats a child’s tongue and mouth with special sugar-free, dye-free sweetening enhancers and a fun, new Dazzleberry flavor. By covering the taste buds of the tongue, the Dazzleberry-flavored liquid helps mask the bitter taste of many medications. Parents spray the product in their child’s mouth before giving medicine. It’s also easy enough to use that children ages 3 and older can have fun spraying their mouth before mom or dad gives them medicine. Product is available for purchase exclusively online at http://www.flavorx.com. Getting children to take their medicine properly is a major concern. Parents certainly know this first hand and it’s even acknowledged by physicians. “There’s over four decades of research documenting non-adherence to medical regimens in pediatrics at roughly 50% for kids with chronic diseases and it can compromise the health and quality of life for children with acute or chronic health conditions” (Rapoff and Barnard, 1991). The bad taste associated with kids medicine is a major contributing factor. Since 1997, Columbia, MD based FLAVORx has successfully improved medication adherence through their pediatric medicine re-flavoring system found in nearly 40,000 locations including Walgreens, CVS, Target and most every other pharmacy chain in the country. “Yo Gabba Gabba! Medicine-Time Flavor Spray” is the company’s first over-the-counter licensed product. FLAVORx is a health care company, based in the Baltimore / Washington D.C. area, that has been helping people of all ages take their medicine since 1994. The FLAVORx Pediatric Flavoring System is available in nearly 40,000 locations across the country, including Walgreens, CVS, Target, Rite Aid and Publix pharmacies. Using FLAVORx's copyrighted flavoring recipes, pharmacists have safely flavored over 40 million prescription and over-the-counter medications for children, making it easier for them and their parents to deal with the stresses of being sick. They also produce Pill Glide, a new product designed to help older children and adults swallow pills, tablets and capsules. For the latest company news, follow FLAVORx on Facebook. YO GABBA GABBA! premiered in the U.S. on Nickelodeon in August, 2007 and currently ranks as one of the most popular series on television with broad appeal among preschoolers, parents, teens and adults. The award-winning series is created by Christian Jacobs and Scott Schultz and is produced by The Magic Store and W!LDBRAIN Entertainment. Jon Berrett and Michael Polis are executive producers. The successful live show, YO GABBA GABBA! LIVE! : THERE’S A PARTY IN MY CITY!, launched in November, 2009 to sold-out shows. The live show is produced by S2BN, W!LDBRAIN and The Magic Store. YO GABBA GABBA!, was voted as one of the best new shows on television by TIME magazine when the show premiered. Rolling Stone voted YO GABBA GABBA! one of the top 50 reasons to watch television. Entertainment Weekly says YO GABBA GABBA! is one of the hippest shows on television and currently ranks among the top 10. YO GABBA GABBA! won a BAFTA Award in 2008, was awarded the “Outstanding Achievement in Children’s Television” Award by the Television Critics Association and is a two-time Emmy nominee. Its companion website, http://www.yogabbagabba.com, won a Kidscreen Award. YO GABBA GABBA! infuses retro-style and beat-driven music to teach simple life lessons through music. The series and the live show stars DJ Lance Rock (Lance Robertson) and a cast of colorful characters, including: Brobee, the little green one, Foofa, the pink flower bubble, Muno, the red Cyclops, Toodee, the blue cat-dragon and Plex, the yellow robot. Today’s most popular names in movies, television, music and sports flock to guest star in the groundbreaking series, including Fred Armisen, Erykah Badu, Jack Black, Anthony Bourdain, Devo, Rachel Dratch, Rob Dyrdek, Flaming Lips, Melora Hardin, Tony Hawk, The Killers, Angela Kinsey, Solange Knowles, Biz Markie, Jack McBrayer, MGMT, Mos Def, Mark Mothersbaugh, The Roots, Andy Samberg, Amy Sedaris, The Shins, Sarah Silverman, Amare Stoudemire, The Ting Tings, Weezer, Jimmy Eat World, Elijah Wood and Weird Al Yankovic, among others. Additional celebrity guests performed during the live tour kick-off shows, including Devenda Banhart, Cold War Kids, Matt Costa, DMC (Run DMC), Snoop Dogg, Jon Heder, Talib Kweli, Mix Master Mike, Kid Sister, Keri Russell and more, while Christina Aguilera, Jason Bateman, Travis Barker, Brendan Fraser, Heidi Klum, Chris Noth, Brooke Shields and Dennis Quaid attended with their families. YO GABBA GABBA! toys, apparel and other merchandise are sold in stores nationwide in the U.S. and have skyrocketed in popularity. The series is now in its third season on Nickelodeon in the U.S., with encore episodes airing 7 days a week on Nick Jr. The series also airs in several major international territories, including Australia, Canada, Israel, Latin America, New Zealand, South Africa and the U.K. YO GABBA GABBA! is recommended as a trusted program for preschoolers by The Smart Television Alliance, a non-profit organization comprised of leading non-profit children’s media organizations including Common Sense Media, Parents’ Choice Foundation, Parents Television Council and Coalition for Quality children’s Media: KIDS FIRST!. Visit http://www.yogabbagabba.com. 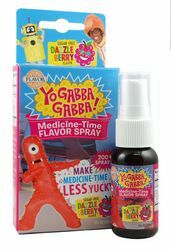 FLAVORx - Helping children and adults take their medicine, vitamins and supplements since 1994 Bottle of Dazzleberry flavored "Yo Gabba Gabba! Medicine-Time Flavor Spray"